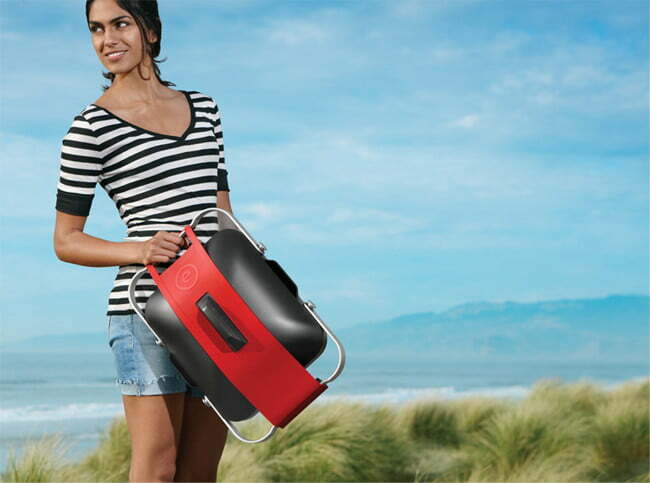 Fuego has recently released its first-ever portable grill, and it is an outdoor enthusiast’s sight to behold. The Fuego Element Portable Grill ($150) boasts 160 square inches of cooking space and a clever design that makes carrying and setting up the grill a breeze. Metal legs fold into place as carrying handles and a red travel band holds the lid, legs, and grill together for easy and secure transport. To make it even easier, the grill also comes with a detachable canvas shoulder strap for carrying, just in case your hands are full of awesome food to be cooked up. The grill works with two different sizes of gas canisters and has a variable control valve to let you adjust the grill temperature for precise cooking. Other features include a cast-iron grill grate, push-button igniter, an 8,000 BTU-per-hour stainless steel burner, and a dishwasher-safe tray to keep things clean.